Persecution of Women in the Public Eye: How Much has Changed? For what reasons are women in the public eye persecuted today, and how is the language used against them different from, or similar to, that used to persecute women in the past? As a society, has our treatment of notable women improved, gotten worse, or remained the same? I will be looking at media coverage and public discourse on Hillary Clinton as she is widely recognizable and has been in the public eye for a significant amount of time. The sexist language used during coverage of her presidential campaign in 2008 stirred up a great deal of debate, and as rumors arise that she may potentially run again in 2016, her actions continue to be scrutinized. In an article examining sexism in the coverage of the 2008 election, Joseph E. Uscinski and Lilly J. Goren collected a sample of comments made about Clinton by reporters on various news programs. They also looked at the different ways reporters referred to Clinton compared to other candidates. A few noteworthy comments include Tucker Carlson’s, “I have often said, when she comes on television, I involuntarily cross my legs,” and Glenn Beck’s claim that her voice, “sounds like my wife saying, ‘take out the garbage.’” Both of these comments play into familiar stereotypes not only of Hilary Clinton, but also of women in general who appear to have a significant amount of power, political or otherwise. This stereotype portrays these women as nagging, power-hungry, and overall threatening to the men that stand in their way. Uscinski and Goren also discovered that in discussions of Clinton’s candidacy, topics ranged from her laugh, to the pantsuits she wore, and her menstrual cycle; during an episode of The Chris Matthews Show, she was depicted with devil horns drawn onto her head. As a woman in the public eye, Hillary Clinton has certainly seen her fair share of criticism using gendered language and stereotypes. Her presence and influence have drawn a great deal of negativity, much like other women in U.S. history who gained notoriety for stepping outside of their determined gender norms. 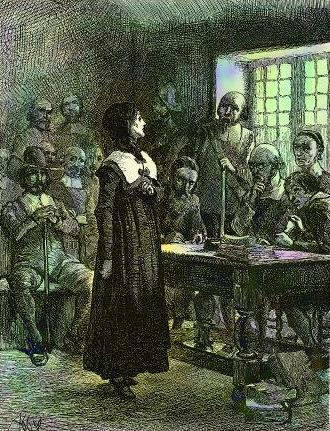 The governor of Massachusetts, John Winthrop, remarked that she was, “notoriously infected,” by Antinomian doctrine, as well as, “censorious and troublesome.” Perhaps some of the most interesting language used in discussing Mary Dyer’s life comes from the accounts surrounding her birthing of a deformed stillborn child; descriptions of the birth allude to the idea that this, “monstrous birth,” was a sign that Dyer herself was a monster or a witch, or that this event was God’s punishment for her heresy. Another one of Hutchinson’s friends and followers, the midwife Jane Hawkins, had been denied membership by her local church and because of her behavior and mannerisms, was the subject of rumors suggesting she may have been associated with the devil. Indeed, by drawing comparisons between the language used to describe these women and that used when discussing public women today illuminates how absurd the media’s treatment of Clinton is today. As discussions of another potential presidential candidacy continue, the popular news media will no doubt continue to discuss Clinton’s every move. The nuances of the rhetoric aimed at women in the public eye during the 17th century and today may differ slightly, but overall it appears that not much has changed. When women past and present have chosen to speak their minds publicly, they have quite often been persecuted as mad, threatening, and even evil. While the historical examples discussed here only represent women from one area and period, surely there is something to be said about the fact that the criticisms used against them are still heard today. Joseph E. Uscinski and Lilly J. Goren, “What’s in a Name? Coverage of Senator Hillary Clinton during the 2008 Democratic Primary,” Political Research Quarterly, 64:4 (2011): 885. Uscinski and Goren, “What’s in a Name?” 892. A religious and political conflict in the Massachusets Bay Colony from 1636 to 1638, between the colony’s ministers and magistrates and those who believed in the teachings of Free Grace Theology. Anne G. Myles, “From Monster to Martyr: Re-Presenting Mary Dyer,” Early American Literature, 36:1 (2001): 8. Emery John Battis, Saints and sectaries; Anne Hutchinson and the Antinomian controversy in the Massachusetts Bay Colony (Chapel Hill: The University of North Carolina Press, 1962), 270. Myles, “From Monster to Martyr,” 3.